This month's property picks from Savills include a Scandinavian style eco apartment in Cambridge, a detached family home with sea views in the Scottish seaside town of Gullane and an award winning modernist style new build on a private estate near Kingston upon Thames. Located in the heart of the private Coombe Hill Estate between Wimbledon and Kingston upon Thames, Ava House is one of a pair of modernist style new build houses designed by Terry Pawson and built by innovative property company Q Developments. There are three/four reception rooms and six/seven double bedrooms with six bath/shower rooms. The latest technology has been installed throughout, enabling music, TV, lighting and underfloor heating to be controlled from personal ipads. Open accommodation over three levels with clever use of glass and light. A swimming pool on the lower ground level opens onto a sunken terrace with a purpose built cinema room, terrace and library. Triple Gold "What House" Awards Winner 2012, including Best Luxury House. 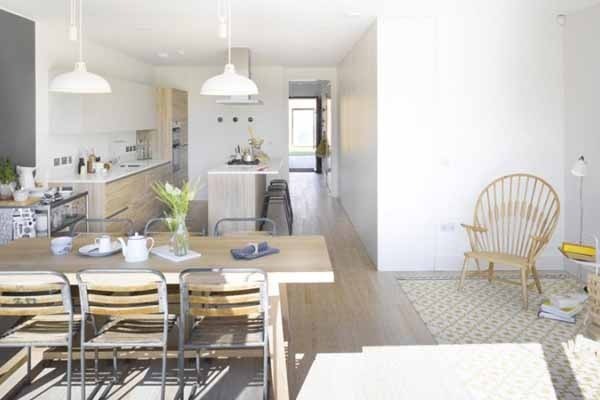 Seven Acres is a new community of contemporary Scandinavian-style sustainable homes in Trumpington, Cambridge built by Skanska. The ethos behind the development is "smart design, sustainable living and sociable community". The apartments have been designed with air, light, space and freedom in mind - large balconies help create a sense of connection to life beyond the front door. Intelligent built in storage and recycling facilities have been included to help you keep a lid on clutter. Properties feature a balance of modern design and traditional, local materials. Eco design credentials include underfloor heating, triple glazing and super insulation, making the properties energy efficient and helping to keep bills down. Gateside is a large family house in a secluded location on a much sought after road in the seaside town of Gullane, around 20 miles from Edinburgh. The accommodation includes three reception rooms, a kitchen/sitting/dining room and a master bedroom plus five further bedrooms. The property also offers sea views and a large garden. 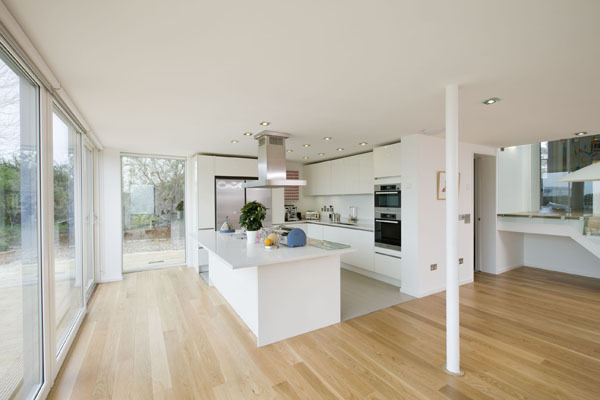 Large contemporary extension designed by an award winning local architect. High quality fixtures and fittings include a German designed kitchen by Hacker and bathrooms and shower rooms with Matki, Hansgrohe and Starck fittings. The property was recently featured in 25 Most Beautiful Homes magazine.